With everything going on in the last few weeks in our family, it has just been to hectic to make cards. Even today's card is one that I had made some time ago but it fits this theme beautifully. This week's LIM challenge is silhouettes. Go take a look at the cards other participants have come up with here. Once again I am inspired by other talents stampers, this time from Stacey O'Shea, Here is my interpretation that fits in with this theme. I hope you enjoyed this entry! I am busy working on a custom order & Christmas gifts and wrappings, so come back soon. 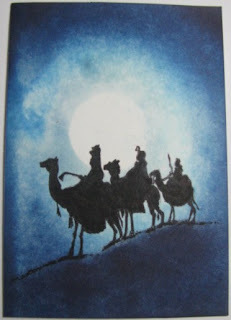 I'm waiting for some Nativity silhouette stamps to arrive... this is great! what a lovely card... that image is beautiful! Really stands out in the gallery. Outstanding! A beautiful card using a striking image with a lovely background. Lots of work in this card, but definitely worth the end result! Beautiful card! Beautiful christmas card. Love the colours. Wow. This is stunning Michelle!! Love the image! What an absolutely stunning Christmas card Michelle! Lovely background, beautiful card. :) Ann Y. Out of so many outstanding cards from this challenge this is one of them that caught my attention. I love you sponged background, it really adds to theme of the stamp. Beautiful night announcing the big event. Really like it. A stunning card - the night sky is fabulous.